Lady Jane Fitzsimmons won our hearts in Once Upon a Wager … and now her story is full of even more delightful twists and turns! Caught up in a scandal of her father’s making, Jane is now an outcast in the society that once prized her refinement. When Lord Benjamin Marworth offers to help redeem her good name, she leaps at the chance. 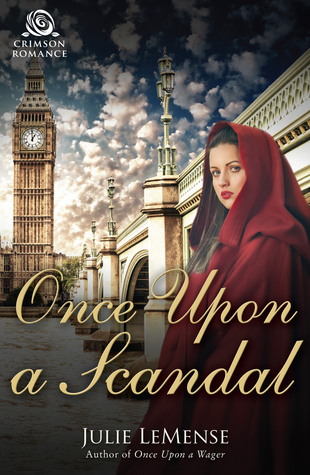 Court politics, betrayal, intrigue...gosh Once Upon a Scandal has everything the historical romance fan loves and more! I loved the depiction of the whirling duplicitious upper class, their judgement and condemnation are palpable as we go through Jane's struggles alongside her. I felt my own cheeks warming at some of the slights and snarky comments...jeeze! Although I didn't read the previous book about Jane, it was clear that she is a character who should be well loved, and you really feel for her fall from grace. While I could see her angst at being relegated to the joke of the ton, I did not really agree with her desire to get right back into the ring and improve her name so she can be part of it's whirling masses once more. Still, you have to admire a girl with ambitions, so she was fun to follow around and get to know. I loved the plot so much! It was tricksy and bound to go wrong in all the right places! It took a LOooOOooong time for Benjamin to catch on that Jane was the girl for him. I liked that. It was way better than the insta-love so predominant in romance novels. I get it, love at first sight is beautiful...but so is that slow and painful kind of romance, where the other person drives you slowly insane until you realize that it's actually love you're feeling and not just indigestion. Or is that just me? Of all of the characters I liked the side characters the best, although the leads were definitely great. It's hard not to absolutely love Aunt Sophia, and wish for her hilarity at your next family reunion, and I loved how each person in the story had their own desires, wants, motivations, and personality. It made for a really well-shaped and enjoyable read all around. “Guessed what, Jane?” he asked casually, though his body had stiffened. He forced a chuckle as something cracked inside him. “You give me far too much credit, my dear. And we have a busy morning ahead of us. We should both get some rest.” They were just outside her door, and the two of them were alone, mere inches apart. Such an innocent she was, not to realize the danger that threatened. A darkness was yawning within him, and it would be so easy to lean down and press his lips to hers, to discover if they were as soft and delicious as they looked. If they could banish the darkness. Did she even have a sense of how tempted he was to try? But she merely smiled and uttered a soft good night, opening her door and shutting it fast behind her. Leaving him alone in the hall, wishing she hadn’t imbued him with false honor. Because he planned to retire to his study downstairs with a bottle of port, where he would chase away his demons by imagining her body, naked to his touch. A Georgetown University graduate with a degree in English Literature, I’ve loved the Regency romance genre since my first deliciously bad Barbara Cartland novel. These days, I prefer the complex characterizations and plotting of Julie Anne Long, Sherry Thomas, Meredith Duran, Courtney Milan, and Sarah MacLean. 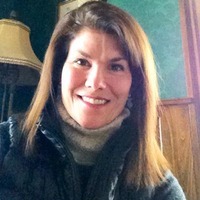 A member of the Romance Writers Association of America, I am currently working on my next novel, as the ghosts who live in my haunted, gilded-age home try to sneak their way into my stories. Julie will be awarding a $10 Amazon or Barnes and Noble GC to a randomly drawn winner via rafflecopter during the tour. A helpful review thank you. I like the excerpt and cover. Great excerpt and thanks for the review. I like the slow build too. I really enjoyed the review and excerpt~thank you for sharing! LOVE the cover! Thanks for sharing your thoughts and the excerpt, sounds like a really good book!